How can the Malta Communications Authority (MCA) help? The extent of the action the MCA can take in relation to your complaint, depends on the particular nature of your complaint and the MCA's relevant legal powers. If the complaint involves issues that are regulated under a law the MCA has the power to enforce, then the MCA can intervene. In instances where the MCA cannot intervene directly, the MCA will suggest alternative courses of action by referring you to the appropriate forum. How can I make an enquiry with the MCA? To submit an enquiry on any of the sectors regulated by MCA, you may use the MCA enquiry form. What are the steps to take when lodging a complaint with the service provider? Where possible, lodge a complaint in writing, explaining your problem clearly and specifying how you expect the service provider to resolve your complaint. State your name and relevant contact details. Support your case with copies of any relevant documentation. Remember you should always retain the original copies of any correspondence or official documentation such as contracts and bills. Identify the service providers representative/s you are dealing with, including date and time of your interactions. Always keep a copy of any written communications you have exchanged with the service provider. Ask for action within a specific and reasonable period. When should I file a complaint with the MCA? We may be able to help you if you still remain unsatisfied with the response and/or solution offered by your service provider, after having gone through your service providers complaint handling procedures. We can then provide you with all the relevant information on the matter, so that you will have a better understanding of what the service providers obligations are, what your rights are and the possible courses of action available to you. What information should I provide to the MCA when filing a complaint? Any other relevant documentation, such as: service termination form; direct debit application form; number portability form. What action can the MCA take to address a complaint? Following due investigation, and subject to the MCAs powers at law, if the Authority considers that the service provider has not effectively addressed the complaint, it will direct the service provider on how to effectively address the matter. What is the MCAs complaint handling procedure? If, after exhausting your service providers complaint handling procedures you still feel that your complaint was not adequately addressed, we may be able to help you. Make any information relating to your case accessible to all parties involved, unless there is a specific and valid request by either you or the service provider. Can an end-user claim compensation? The Authority may only require a service provider to give compensation to a customer, in line with the service providers compensation schemes, if the quality of service levels agreed upon in the contract for the provision of your service, are not met. The above is not applicable in cases of force majeure. Service providers may, of course, voluntarily agree to offer compensation other than in the instances mentioned above, however this is at their discretion. This does not mean that you cannot seek compensation before other bodies. In most instances, if you believe that you have been provided a service which is not satisfactory and that you are entitled to compensation, then as a consumer you may file a claim before the Consumer Claims Tribunal. This Tribunal is empowered to determine disputes between customers and traders. For further information you can contact the Consumer Claims Tribunal's secretariat at 4, Old Mint Street, Valletta CMR 02. You can also phone on 21 239 892. Their office hours are between 0900hrs and 1230hrs. If you own a business concern, then you have recourse to the Small Claims Tribunal. The Small Claims Tribunal is located at the Courts of Justice, Republic Street, Valletta. Their telephone numbers are 2590 2601 or 2590 2242 and their office hours are between 0900hrs and 1500hrs. What is a postal article? A postal article is an article (such as a letter, parcel etc.) addressed to you which is delivered by a postal operator. There are different types of postal articles available. These include ordinary mail, registered mail, bulk mail, express mail etc. What is a Universal Postal Service? The Universal Postal Service ensures that you have access to postal services that are necessary for everyday life. Maltapost is the designated universal service provider responsible to provide these universal services which incorporate both the collection of letters and packages domestically and internationally. Therefore MCA imposes certain obligations on Maltapost on the quality of service, including, the duration of delivery of post and ensures the affordability of the postal service. How should I address letters and parcels? 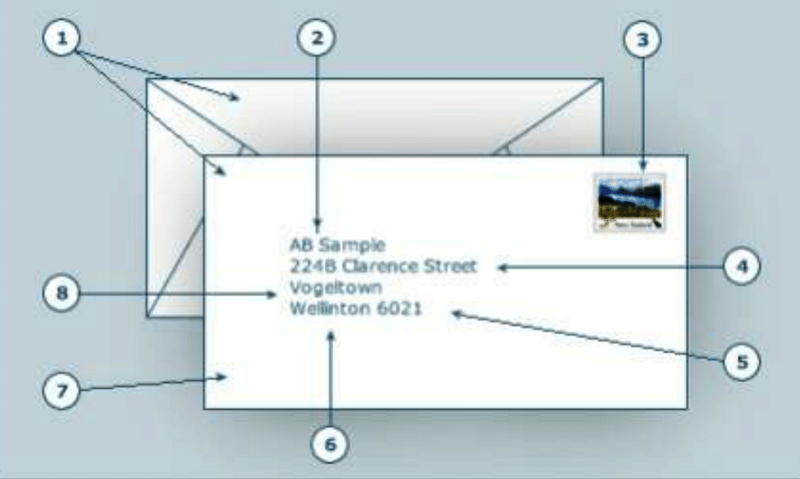 In order to ensure that your mail gets delivered promptly and correctly, it is important to address and stamp the envelope or parcel accurately. If you need to find any local postcodes, log on to MaltaPost’s postcode finder. What are the correct letterbox specifications? What items are prohibited from being posted? You must not post any item which is prohibited, or which include items that are dangerous, explosive or illegal, or which are listed on MaltaPost’s website. These lists are updated regularly. Although some of the items listed may seem harmless to you, they can become dangerous when being transported. Remember it is your responsibility to check whether an item is prohibited or not and acceptance by the postal operator does not free you of this responsibility. How can I track and trace registered articles? You can track registered postal articles using the International Courier Service by either selecting the Track and Trace feature on MaltaPost’s home page and inputting, as directed, the 13-digit number under the barcode and pressing SEARCH or otherwise by calling MaltaPost Customer Care on telephone 21224421, or by emailing info@maltapost.com and quoting the said number. The range of tracking information (including final delivery) depends of tracking capability of the receiving postal operator. eCommerce (electronic commerce) is the buying and selling of goods and services, or the transmitting of funds or data, over an electronic network, primarily the Internet. These business transactions occur either business-to-business, business-to-consumer, consumer-to-consumer or consumer-to-business. Almost any product or service can be offered via ecommerce, from books and music to financial services and plane tickets. What shall I look for when buying online? An e-mail address and telephone number where you can contact the company with questions or problems. It is also advisable to review feedback and comments submitted by customers who already bought from the website. What shall I do before buying a product or service? Accurately read all the information about the product or service you intend to buy or subscribe to. Also take note of the instructions for proper use of products, including safety and health-care warnings. Carefully look at any pictures/photos of the product. If you intend to take part in an online auction, make sure that you understand all the rules associated with the auction and the terms and conditions associated with any purchases you could make. Never bid on an item if you do not intend to purchase. Remember that if you are the highest bidder, you are obliged to follow through with the transaction. If necessary, contact the seller to clarify any questions or request more information before you place an order. Shipping and handling costs: Check to make sure that you are not paying a premium for express shipping unless you really want something quickly and are willing to pay the extra cost. Taxes and duties: When buying online from outside of the European Union (E.U. ), customs duty and VAT will be charged when the item arrives in Malta. The rate and type of duty charged will depend on the type, quantity and value of items. [Further information may be obtained from the Department of Customs, Ministry of Finance, the Economy and Investment (MFIN)]. What shall I do before confirming the purchase? Carefully read the terms and conditions of the purchase agreement (contract), especially any restrictions or limitations on the sale, such as return policies, cash-back policies or damaged goods policies. Once you know the full cost of the purchase, confirm that your order is correct before you pay. A serious business will give you a clear summary of your order before you proceed to payment, sometimes referred to as ‘checking-out’ and provide an opportunity to revise your order if there are any incorrect details or quantities. When your order is submitted, you should receive a confirmation e-mail or a receipt. If it doesn’t match what you wanted/ordered, immediately notify the seller by email or telephone. It is important that you print and/or save a copy of the confirmation page. What responsibility the seller is willing to take if the item doesn’t work or causes damage. Take note of when you can expect to receive your purchases. Unless otherwise agreed, the seller must deliver your order within thirty (30) days from the day after you placed your order. Whether or not you would have to pay to ship the item back and/or be charged a ‘restocking’ fee. Print and/or save a record of the terms and conditions, warranties, item description, company information, confirmation emails, and save them with the records of your purchase. Also, save a copy of any correspondence with the seller: this might be useful in case a problem arises. How can I ensure that my personal details are safeguarded? Most online transactions will require the use of a username and/or password. Therefore, make sure your password is unique by choosing a combination of letters, numbers and punctuation marks. Change your password regularly and do not use the same password for more than one account. Ensure that the seller is offering a secure checkout process. This will ensure that your personal and financial information can only be read by the seller and the credit card issuer and cannot be tampered with by other parties. What security measures shall I look out for when buying online? Check the web address of the page where you are being asked for your credit card details. If the page starts with ‘https://www’ as opposed to the ordinary ‘http://www’, then this is indicative that it is a secure site. Furthermore, if the address bar turns green, this may also indicate that the site has an additional level of security. Search for an icon of an ‘unbroken key’ or closed ‘padlock’ at the bottom of the browser window. A processing error has taken place. Online payment services handle the transfer of money between you and the seller when buying online. Online businesses offering this service will allow you to set up a personal account that can be used to purchase from various online sellers around the world, without the need to retype your credit card information for each transaction. You will only need to provide your account information once; and then this is stored securely by the online payment service provider. How can I avoid being a victim of any online theft? Watch out for identity theft when shopping online. This happens when your personal and financial information is stolen and used illegally to open accounts in your name. You should pay attention for fake emails, called ‘spoof emails’. These emails appear to have been sent by well-known/reputable companies or popular web-sites, for example, your bank, insurance agency, online auctions etc., and ask you to reply with personal and financial information. This practice is known as ‘phishing’ or ‘spoofing’. Never reply to e-mails that you receive from someone you do not know or from someone that is asking for personal information. Delete these messages immediately! Do not open e-mail attachments or click on links embedded within any potentially suspicious email, because this might be forged. We suggest you open a new Internet window and manually type in the link’s URL into the address bar - this will direct you to the legitimate website. Never pay via email when shopping online by providing your credit cards details in an ordinary e-mail. Regularly review your credit card and bank statements to look for any possible fraudulent charges or withdrawals. From where can I get further information in case I experience any difficulties while purchasing online? In case you have a dispute with local online businesses, you may seek guidance from the Malta Competition and Consumer Affairs Authority (MCCAA). The MCCAA is the entity responsible for ensuring conformity with the Consumer Rights Regulations. In case you have a dispute with a business which operates in another EU country, you may seek guidance from the European Consumer Centre (ECC). How can I view the free-to-air channels? You need a UHF aerial and a digital decoder or a digital TV. If you have a modern or flat panel, like an LCD, LED or plasma TV, you probably already have the necessary digital equipment built into your TV set, and you may not need anything else. On the other hand if you have an older TV set, such as the tube type, you need to buy a digital decoder. How many channels are transmitted via free-to-air? Currently there are eight (8) Maltese channels transmitted via free-to-air: Xejk, F Living, Net, One, Smash, TVM, TVM 2 and Parliament TV. In which direction should I position my aerial? Your aerial should face one of the following locations: Marsaxlokk (Tas-Silġ), Nadur, Mellieha, Mtarfa, Naxxar or Portomaso, as transmitters are located in these areas. From where can I buy a digital decoder or a digital TV? You may purchase a digital decoder or a digital TV from any shop of your choice. However, you must check with the salesperson whether the equipment purchased is suitable to view the free-to-air channels. Before you shop for a decoder, make a note of the brand and model of your TV so that the sales person can show you compatible digital decoders and provide you with a suitable video cable. How do I install a digital decoder? Before you install your digital decoder, you should always read the instructions provided carefully. The information below describes the installation of a digital decoder and does not substitute the instructions provided with the digital decoder. Unplug the TV plug from the wall power socket. Remove the aerial cable from the back of the TV set and connect it to the socket marked ANT IN on the digital decoder. Connect one end of the video lead to the socket marked TV on the decoder and the other end to the TV. Plug the power leads on your decoder and TV into a wall power socket. Switch on the decoder and the TV. Your TV will usually be able to detect the new digital decoder automatically, but if this does not happen simply select station AV1 on your TV remote control. International roaming is a service offered by mobile operators that allows you to use your current mobile service with your local operator when abroad. Since your mobile operator does not provide its services outside Malta, it has agreements with foreign operators allowing you to make and receive voice calls, send and receive SMSs, and use other services such as voicemail and data services, whilst you are travelling in other countries. 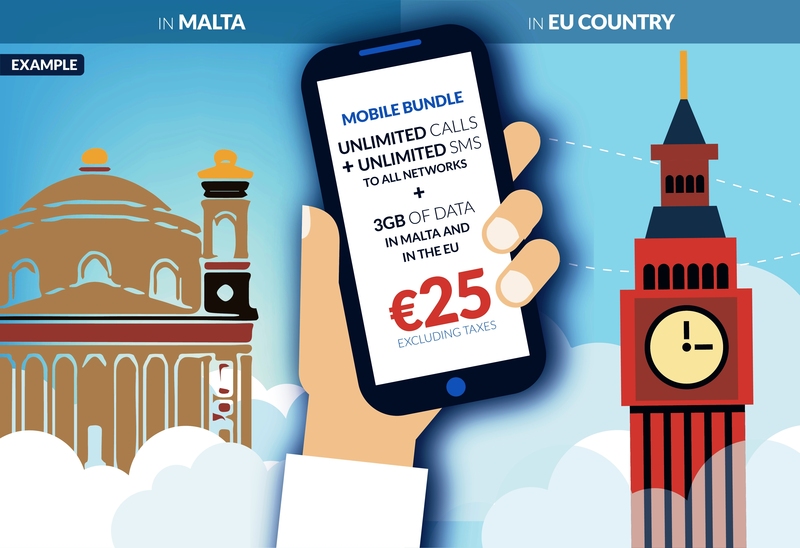 Does international roaming include calls and SMSs made from Malta to another country? No. 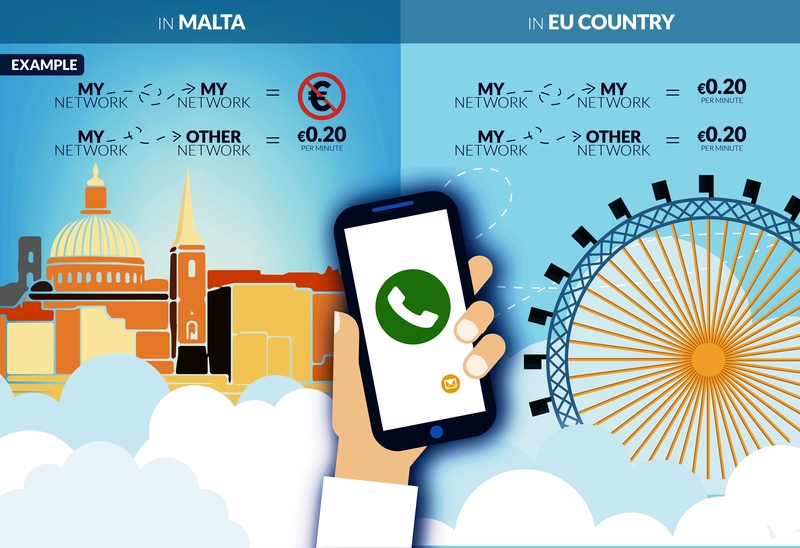 When calling or sending an SMS from Malta to any other country, this is referred to as international calling or international SMS and not international roaming. This means that any regulations related to international roaming do not apply in case of international calls or SMSs made from Malta to another country and may carry with it different tariffs to those applicable in the case of roaming. how to activate and make use of other important services (voicemail, call diverts, network selection) while roaming and the charges involved. Note: Make sure you take note of the below information, in case your phone is lost or stolen while you are travelling. Your mobile operator customer care number. What happens when I am roaming in an EU country? As from the 15th June 2017, when travelling in any EU country, you will be charged the same as if you were using your mobile phone at home referred to as Roam Like At Home (RLAH). In this respect when roaming in EU countries your domestic rates will apply, however, there are a few exceptions which will be discussed into further detail below. What happens when I am roaming outside the EU? The RLAH measure does not apply in countries outside the EU, however in accordance with the EU Roaming Regulations there a number of consumer protection measures which are applicable whilst roaming in these countries. We suggest you check with your mobile operator how much you will be charged for making and/or receiving calls and SMSs, data usage, and voicemail. If you decide that you want to disable any of the above facilities to avoid such charges, enquire with your service provider to guide you accordingly. Can I benefit from the Roam Like at Home (RLAH) tariffs when I am on ships or planes within the EU? In most cases, when travelling on ships and planes, the EU Roaming Regulation would not apply. There could be circumstances when cruising in the vicinity of an EU territory (such as rivers, lakes or along the coast) where you may connect with a typical mobile network. 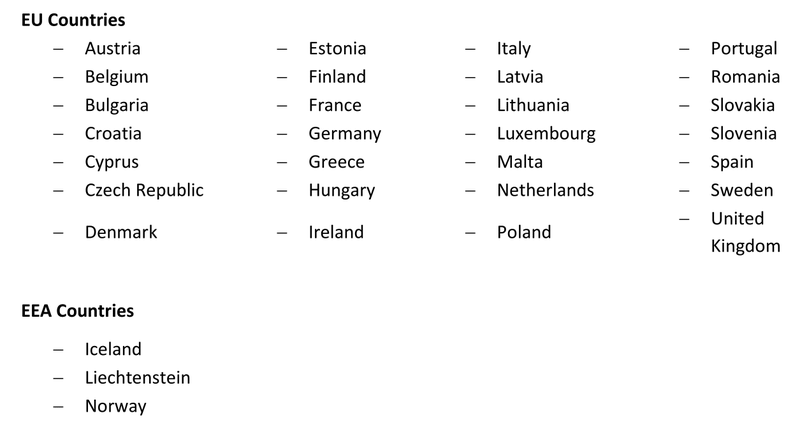 In which European countries can I benefit from the RLAH tariffs? RLAH tariffs apply when travelling in EU member states and also in European Economic Area (EEA) countries (Iceland, Liechtenstein and Norway). What is domestic pricing for the purpose of the new RLAH tariff? Domestic pricing means the amount charged on a per unit basis for calls, SMSs and data made whilst using your mobile in the Maltese Islands. The domestic price differs from one tariff plan to another and even between service providers. 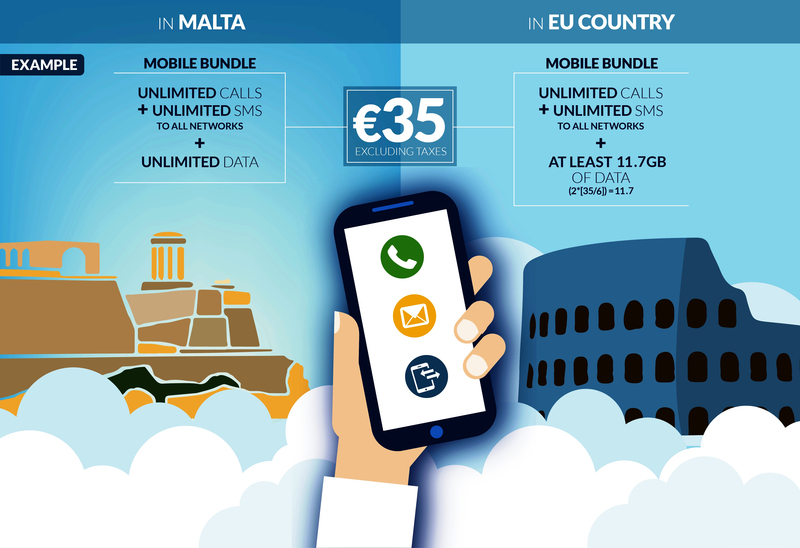 The EU Roaming Regulation states that the domestic retail price used for calculating a RLAH tariff, could be at a maximum, the price for a call/SMS made to a network other than the one you are subscribed to whilst in Malta. This is also referred to as the off-net rate. 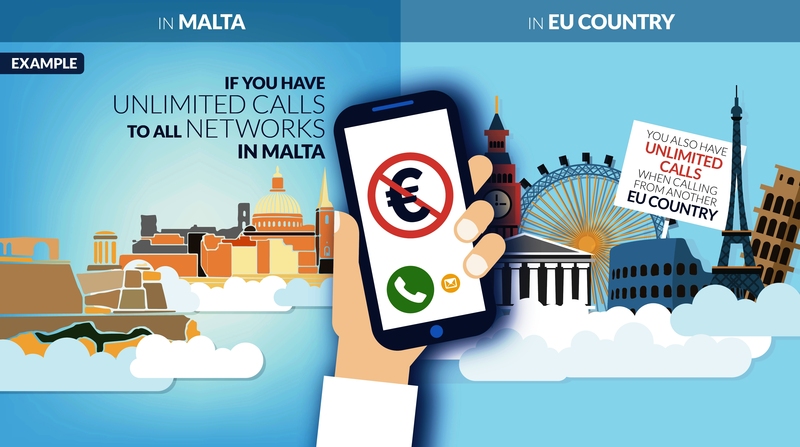 Example 1: If you are subscribed to a mobile package where you enjoy unlimited calls to all networks, when calling from another EU country to Malta or to any other EU country you will not be charged for any calls. Example 2: Your mobile package includes unlimited calls to the same network you are subscribed to (on-net calls) and a charge of €0.20 per minute for calls made to subscribers of other networks (off-net calls). However, when calling someone on the same network you are subscribed to whilst roaming in an EU country, the off-net domestic rate of €0.20 per minute could apply. Note: You will not be charged for any calls received whilst travelling within the EU, however, charges may apply if you travel outside the EU. Are there scenarios when RLAH would not be applicable when travelling in any EU country? Your service provider may request certain information (e.g. official identification document, declaration by employer and/or academic body etc.) upon concluding your contract or after it has monitored your usage pattern for four consecutive months and determines that your roaming usage is higher than your domestic use. If you fail to provide such sufficient proof your service provider can start applying the following surcharges. Data capped at a surcharge of €6/GB (excluding VAT and excise tax). What is Fair Use Policy (FUP)? The FUP is a measure mobile telephony services providers may implement in the case of RLAH to prevent abusive and anomalous usage in an EU country, such as the use of roaming services other than for periodic travel. In which scenarios can the FUP be applicable? FUP may be applicable in cases of metered (per unit basis) data for pre-paid subscribers and/or open data bundles. How can the FUP be determined in the case of metered data for prepaid subscribers? If you are on a pre-paid basis and your domestic unit price of data works out less than the wholesale rate of €6/GB, your service provider may apply a data limit whilst roaming in the EU. The data limit is calculated by dividing the remaining credit available on your card when you start using data roaming services (excluding taxes) by €6 to establish your data limit in GB. For the purpose of the EU Roaming Regulation there are 1,000MB in every GB and 1,000KB in every MB. How can the FUP be determined in the case of open data bundles? Open data bundles can be classified into two; packages which offer unlimited data and packages for which the domestic unit price of data is less than the wholesale rate. Your national mobile bundle includes unlimited data, your operator must provide you with a large volume of roam like at home data depending on the price of your mobile bundle. Your operator should clearly inform you of this roam like at home data allowance. In case you use more data while roaming than the data allowance foresees, you may have to pay a small charge which amounts to €6/GB. If you want to check the operator’s calculation, here is how: the roaming data volume must be at least twice the volume obtained by dividing the price of your mobile bundle (excluding VAT) by €6. For your information, €6 is the maximum price that your operator has to pay the foreign operator for 1 GB of data when you are abroad in the EU during 2018. Example: At home, you have a mobile bundle including unlimited calls, SMS and data for €35 excluding taxes. When travelling in the EU, you get roam like at home for unlimited calls and SMS, and at least 11.7GB of data (2*(35/6) =11.7). The operator is only entitled to apply a roam like at home data limit in 2018 in case you pay less than €3/GB of data used (in 2019 less than €2.25/GB). The actual limit depends on the monthly amount you pay for your mobile contract. The limit is calculated as in the previous answer. Example 1: At home you have a mobile bundle including unlimited calls, SMS and 3 GB of data for €25 excluding taxes. In this case, €25 / 3GB = €8.3/GB. When travelling in the EU, you get roam like at home with unlimited calls and SMS, and 3 GB of data, exactly like at home. Example 2: At home you have a mobile bundle including unlimited calls, SMS and 10 GB of data for €25 excluding taxes. The calculation is €25 / 10GB = €2.5/ GB. When travelling in the EU, you get RLAH with unlimited calls and SMS, and at least 8.3 GB of data (2*(25/6) = 8.3). If the operator wishes to apply such a data limit while roaming, they must clearly inform you of the volume available and whenever you have consumed that volume while abroad. Can my service provider offer me a plan explicitly for local use without the facility to use my services outside the Maltese Islands? Yes, the EU Roaming Regulation allows your service provider to offer tariff plans which can only be used locally. However, your service provider cannot offer an add-on package allowing the use of roaming services on top of this tariff plan. Will I be informed on how much calls, SMSs and data will cost whilst roaming? Information on the possibility to access the 112 emergency number free of charge. Should you not wish to receive any notification referred to above, you can opt-out at any time free of charge by contacting your mobile operator. Nonetheless, you can opt-back in at any time free of charge. Note: Roaming related notifications should be sent by your service provider even when travelling outside the EU. Is there a mechanism which prevents me from receiving high bills related to data services? Your service provider is required to enable you to control how much you spend on data services. To ensure that you do not accidentally run up huge bills when you connect to the Internet using your mobile phone or other mobile device whilst roaming a cut-off mechanism applies. A request from your part to remove the default cut-off limit or opt for another limit shall be carried out within one working day from receipt of your request, free of charge and without any other conditions or restrictions. In addition to the above, the Roaming Regulation also stipulates that your service provider shall send you the following notifications. When you reach the agreed limit, you will receive a notification informing you of the procedure to be followed if you wish to continue to use the data service in that particular month and the cost of additional data. If you do not respond as prompted, your operator will cut off the data service for that month. Note: This cut-off mechanism applies whether roaming in an EU country and also outside the EU. In cases where such mechanism cannot be provided when travelling outside an EU country, your mobile operator shall inform you in your notification message once you enter such country. How can I start benefitting from the RLAH? You may switch to or from the RLAH to another tariff at any time free of charge. I am subscribed to an alternative roaming package, can I remain on this tariff plan? Yes. Your service provider will contact you and will inform you whether you would like to remain on the alternative roaming package. If you decide to remain on the package, you will not experience any change, however, if you do not do anything, your service provider will switch your plan to the RLAH tariff plan. Where can I find more information on how much I will be charged whilst roaming in the EU? While the purpose of these FAQs is to give you a general overview on the EU Roaming Regulation, your service provider can provide you with further benefits whilst on the RLAH tariff, such as not applying a fair use policy. In this respect, should you wish to enquire about the rates applicable to your particular plan whilst roaming, we invite you to first contact your mobile service provider. 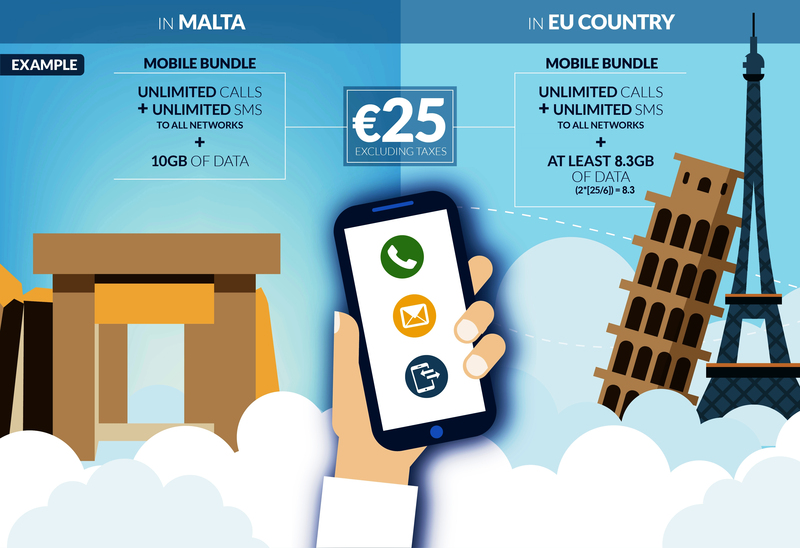 Where can I find further information on the EU Roaming Regulation? Note: These FAQs are without prejudice to the legal obligations on mobile network operators established in Regulation (EU) No 531/2012 on roaming on public mobile communications networks within the Union. Premium rate numbers are telephone numbers used to offer value added services to subscribers at a charge. Does a call towards a premium number cost more than that to a standard fixed or mobile line? The applicable charge for a call to a premium rate number is usually higher than the price of a standard call to a fixed or mobile line. Unlike a standard call towards a fixed or mobile line, the charge for a call to a premium rate number consists of the standard fixed call charge and an additional service charge. What are the premium rate numbers in Malta? The premium rate numbers currently used by the local service providers are those starting with 50, 51, and 52. (Note that premium rate numbers in other countries may have number structures which are different from those applicable in Malta). How can I know whether a number is a premium number or not? Contact your service provider for information on specific premium numbers. Broadband usage is the amount of data you upload and download from the Internet. In the early days of the Internet, the Internet was mainly used to send emails and browse websites. Such activities did not consume high levels of data and hence broadband usage was low. However, with the advances in technology, what we do on the Internet has now changed. Internet usage pattern has changed along the years and nowadays we are using the Internet to stream live TV content and movies, to download files, for online gaming, to stream, etc. Such activities consume a considerably high amount of data when compared to other so called traditional activities such as sending emails and browsing websites. This means that the overall broadband usage has increased. How much broadband usage do I have? This depends on the package you are subscribed to and its service contract. If you are subscribed to an Internet package which has a download limit, after exceeding such limit you will either continue using the Internet at an additional charge, or else your Internet speed will be automatically slowed down. Such information should always be listed in your contract. Alternatively, if you are a heavy Internet user engaging in various online activities, you will most probably require an Internet package which has an unlimited download limit together with an adequate Internet speed which supports your usage pattern. What is traffic management policy? Various elements making up the Internet service provider infrastructure, are used to deliver the Internet service which is shared amongst a number of users and the resources are not fully reserved to a particular user. To give an example on how the Internet works, one can compare it to the road network system. Much like the roads are used by a number of people, so is the Internet service. Similar to the road network, when the number of users increase, congestion may occur, possibly resulting in a temporarily slow Internet connection. In order to minimise Internet traffic congestion, service providers may implement traffic management policies to ensure that all network resources are fully used in an efficient manner to maximise the Internet experience of users and minimise congestion. Are there any regulations regarding traffic management? In the past months, the EU has been working to issue a set of regulations regarding the open Internet access, known as Net Neutrality. These regulations have come into force, and are applicable as from 30th April 2016. Amongst other things, this regulation will require that all traffic will be treated equally. This means, for example, that the ISP cannot use traffic management to block traffic from or to specific users. At the same time, equal treatment allows reasonable day to day traffic management according to justified technical requirements, and which must be independent of the origin or destination of the traffic and of any commercial considerations. Common rules on net neutrality mean that Internet access providers cannot pick winners or losers on the Internet, or decide which content and services are available. How can I find the traffic management policy of my ISP? As from the 30th of April 2016, ISPs must list any traffic management policies and how such measures could impact the quality of the Internet service, in the terms and conditions of subscriber contracts which are also accessible on the service provider's website. What is a standard bill? You will receive a standard bill if you are subscribed to an electronic communications (TV, Internet, fixed and mobile telephony) post-paid service. As a minimum a standard bill should include information on the types of services or bundles you are subscribed to, and total dues for a defined billing period. What is a detailed itemised bill? You can have access to a detailed itemised bill if you are subscribed to a telephony post-paid service.The detailed itemised bill should include usage and cost related information on each telephony related transaction made from your mobile or fixed line, such as in the case of each voice call, SMS, MMS and data session used throughout the billing period in question whether as part of a bundled tariff plan or not. If I am subscribed to a post-paid service, can I access my bills electronically? If you have an internet connection, you can access your standard and itemised bills electronically free of charge, normally through an online system. How can I access my bills electronically? Every service provider adopts different mechanisms on how subscribers can access their bills electronically. Service providers have an online portal where subscribers can log onto such portal with their personalised username and password to access their bills. Moreover, most service providers also provide the possibility to send you an email notification whenever a bill has been uploaded. If you enquire with your service provider on how to access your bills electronically, your service provider should offer the necessary assistance and information. For how long can I view my online bills? The online system operated by your service provider shall enable you to retrieve copies of your electronic bills for the past six (6) months. Should you wish to view your online bills for a longer period, it is advisable to download such bills and save a copy. If I do not have an Internet connection, how can I receive my bills? If you do not have an internet connection, you have the right to ask your service provider to receive your bills in printed format free of charge. In this case, it is advisable to contact your service provider directly. Some service providers may require you to sign a declaration stating that you do not have an Internet subscription. If I am subscribed to a telephony pre-paid service, can I request information on my usage? Generally if you are subscribed to a pre-paid service you do not receive periodic bills as you purchase the credit beforehand. Nevertheless, if you wish to see any transaction made from your fixed and/or mobile telephony service, you may request your service provider for a detailed report on your usage by visiting any of your service providers' outlets. It is advisable that you contact your service provider before visiting an outlet. If you request a copy of your detailed usage report in printed format, your service provider may charge you a fee. Note: Since, such information is quite personal and sensitive, your service provider may request to verify your identity before providing a detailed usage report. In many instances, service providers follow certain authentication measures which have to be in line with data protection laws. You may wish to seek further information on this subject by accessing MCA's decision on Standard and Itemised Billing. Can a service provider change any of the terms and conditions of my contract? Yes, service providers can change the Ts & Cs of your contract. In doing so, service providers must inform you one (1) month prior to the implementation of the said changes, in writing. Notifications to mobile pre-paid subscribers may be sent by SMS. If my service provider proposes changes to my contract, do I have the right to terminate the service? Yes, if you disagree with these changes, you have the right to withdraw from the contract without incurring any penalties within the notification period, which cannot be less than thirty (30) days. Should I disagree with changes to my contract proposed by my service provider, how can I terminate my contract? In the notification letter sent by your service provider, you will be informed how to inform your service provider of your intention to terminate the contract. For example, you may be required to send a written letter to your service provider, send an online request, etc. If no information is provided in the notification letter sent by the service provider, you should follow the termination procedure as specified in your contract. If I paid for the service in advance, will I be refunded any remaining advance payment? Yes, you are entitled to a refund of any fees paid in advance for the subscription of your service payments. The notification sent by your service provider will specify the manner in which any advance payment covering the remaining period of your contract will be refunded should you terminate the service. The above excludes any payments and/or subsidies for benefits that the service provider may have granted to the subscriber. By way of example in the mobile telephony sector, service providers may offer subsidised or free mobile handsets to subscribers entering a definite contract. Number portability enables you to retain your fixed/mobile number when switching to another service provider. What are the factors to consider before porting? You must not terminate the fixed/mobile telephony service before you port. This has to be done by your new service provider as part of the porting process. What steps should I take to apply for porting? a copy of a recent bill or statement (in case of post-paid). At the outlet, fill in a porting form. The service provider will carry out the process to transfer your existing number on your behalf. It is important that the person signing the porting form is the subscriber, or his/her legally authorised representative. Ensure you settle all outstanding bills with your service provider in case you are a post-paid subscriber. What shall I do if I encounter any difficulties while my number is being ported? It is important that you contact and inform your new service provider with any issues that you encounter during the porting process. Your new service provider is responsible to ensure that the porting process is completed and that any issues that may arise during such process are resolved. What are my rights and obligations after my number has been ported? When you port your number, you are tied to the new service provider for a minimum period of two months from when your number was effectively ported. The email forwarding service ensures that if you use an electronic mail service provided by your ISP, you can terminate your internet service without having to lose any email/s which goes to your email address. You can ask your ISP to forward all emails addressed to your original email address to any new email address. When doing so, the ISP will also send an automated reply to every e-mail received on the original email address with a message informing the sender of the forwarding service and the new email address. Can I retain the same email address when I change my ISP? This depends on your ISP. Some ISPs provide a stand-alone email service, whilst others will only provide this email service in conjunction with an internet service. When can I request the email forwarding service? This service can only be requested upon termination of an internet subscription. When requesting email forwarding services, you are required to provide a new email address, so that the emails sent to the original email address will be forwarded to your new email address. From where can I obtain a new email address? You may opt for a free web-based email service, for example, Gmail, Hotmail or Yahoo. Note that you should not use free email services to send sensitive information, because these services do not have a high level of security. Therefore, should you require an increased level of service and security, you may opt for an email service, against a fee. Such services are provided by a number of companies both locally and internationally. If you have a business, you may register your own domain, for example, mydomain.com. This will allow you to host your email accounts at any ISP you like whilst retaining your email account even if you change ISP. For how long shall I benefit from the email forwarding service? You can benefit from such service for a period of one year without incurring any additional costs. On expiry of the first year, the service provider may offer such service at a cost. How do I terminate my contract with my service provider? Be aware that if you are subscribed to a pre-paid account with your existing service provider you may lose any unused credit. If I decide to terminate my contract before the initial term has expired shall I be charged an early termination fee? Contracts which establish a minimum contractual period are normally subject to an early termination fee. You may review your contract or enquire with your service provider to verify whether this is applicable in your case. If my contract has expired (i.e. my initial term has elapsed), should the service provider terminate my contract? This depends on what is listed in your contract. Generally service providers renew subscriber contracts for an indefinite period. If your contract has been renewed after the initial contractual period has expired, you will not be charged an early termination fee if you chose to terminate the contract. An early termination fee can apply if you enter a new contract for a new minimum contractual period. In such cases you would be required to sign a new contract. Should my service stop as soon as I inform my service provider with my intention to terminate my contract? Service providers can require subscribers to notify them in advance of their intention to terminate the service. Such advance notification period cannot exceed one (1) month. In such instances you will still be billed for the service during this notice period. Mobile data allows you to gain wireless access to the Internet, any time, any place. However, you must have a data enabled mobile phone to access such services. Essentially, whenever you read your emails, browse the Internet, share photos online, stream movies, or use social networking sites, you are making use of data services. 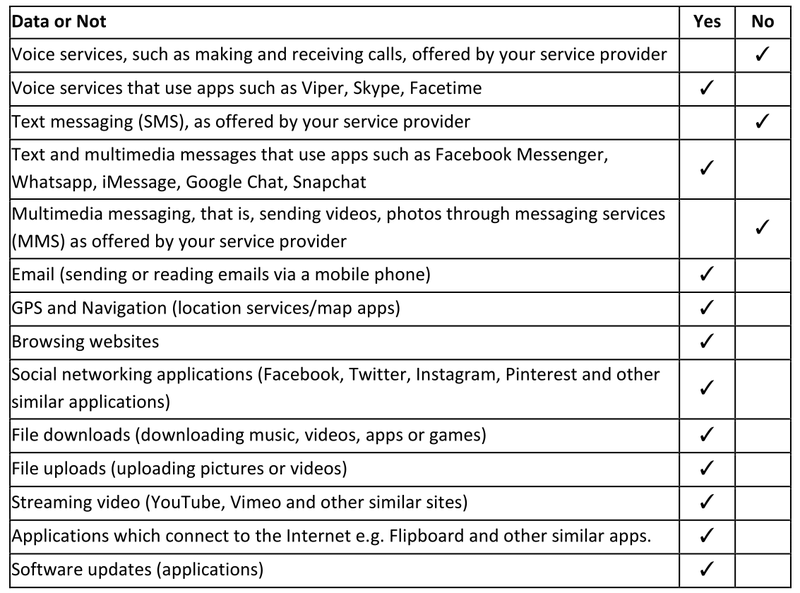 The below table provides a clear indication as to which services or applications actually consume data from your mobile package. How can I use these data services on my mobile phone? At the outset, you need to have a data enabled mobile phone in order to enjoy data services. Mobile phones typically connect to the Internet, either through a WiFi connection or via mobile data. You would therefore, either need to have a mobile subscription that also provides for data services, or else you may opt to make use of a paid, or free WiFi hotspot. If you have mobile data services enabled on your mobile phone and have a subscription that supports these services, then you can use the Internet on your phone even when WiFi is not readily available. Many mobile telephony packages available on the market offer a pre-determined amount of data, free of charge, as part of the subscription plan. Some service providers also offer you the possibility of purchasing data bundles, over and above the allocated data allowance. How much mobile data will I need? The amount of mobile data that you will need will depend very much on how often you intend to use it and particularly, on your specific activity on the Internet on your mobile phone. For example, if you use the Internet on your mobile phone to watch videos on YouTube (especially if these videos are in High Definition) and download large files, you will consume more data than if you use the Internet to read your emails or to browse websites. Understanding your monthly data usage will help you choose the right mobile data plan for you. The below graphical representation will shed some light on the level of mobile data consumption, depending on the service or application being used. Note: Mobile data consumption may differ from one mobile phone to another. How will I know when I reach my mobile data plan limit? Certain service providers may send you an automatic notification before, and upon exhausting the free allocated data allowance. Certain service providers also offer the facility to enquire about your data consumption by sending an SMS to a particular number. You would then receive a reply indicating your data balance. It is important to enquire with your service provider about the different mechanisms available to control your data consumption. If you continue using data services after you have exhausted your data allowance within your plan, you will be charged for such data. Such charges should be listed in your contract upon subscribing to the service. You can use such services, free of charge, only if you connect to a free WiFi hotspot. How can I monitor my mobile data usage? Mobile data is calculated in terms of kilobyte (KB), megabyte (MB), and gigabyte (GB). There are 1,024 KB in 1 MB and 1,024 MB in 1 GB. Most of the data tariffs are calculated, and/or charged, on a per MB basis. Certain smartphones have in-built applications which provide an approximation of mobile data usage at regular intervals during your mobile data subscription period. There are also a good number of data monitoring applications readily available for download from the web. You also have the possibility to review your data usage pattern in retrospect, by viewing your itemised bill which provides you with a detailed description of your data usage through the previous billing period. This can provide valuable insight into how you can control, or make better use of your mobile data package in the following months. Whilst the various monitoring data applications provide an approximation of your mobile data consumption, the itemised bill provided by your service provider shows the true extent of your data usage. Is there a difference between a 3G and a 4G internet connection and how is it affecting my mobile data consumption? 3G stands for ‘Third Generation Network’. Similarly, 4G stands for ‘Fourth Generation Network’. Both 3G and 4G networks enable you to access mobile data, however the speed of the Internet connection is the differentiating factor between the two networks. 4G networks provide higher Internet speeds when compared to a 3G network. The difference between these two networks does not affect your mobile data consumption. However, due to the higher speeds offered by a 4G network, you are more likely to engage in increased online activity, which directly impacts the amount of mobile data consumed. How can I avoid unnecessary mobile data consumption? Alternatively, if you do not want to turn off your mobile data facilities, restrict background data. Some of your mobile applications consume data even if you are not using them. Review your mobile settings accordingly. Connect to a WiFi hotspot whenever this is possible. The MCA, in collaboration with other entities, provides over 340 WiFi hotspots around Malta and Gozo. We have also developed a free App - ‘MCA Malta Free WiFi’, which is available for download from Google Playstore and Apple Store, which locates the nearest MCA’s WiFi hotspots according to your given location. For further information visit our WiFi section.Today, many food and beverage establishments, entertainment and public places offer free WiFi facilities, so make use of these whenever possible to preserve your mobile data allowance. Many mobile phones offer the facility to restrict any applications updates to be undertaken using a WiFi connection only. In such cases, you would need to set the device settings accordingly. Turn off push notifications. Your phone may have an option to stop you from receiving any automatic notifications upon receipt of new emails or any incoming news from your social media accounts. Avoid using your personal mobile phone as a personal hotspot whilst using mobile data as other wireless devices can connect and consume data from your mobile data package. Use mobilefriendly websites whenever possible. Websites which are optimised for mobile use (i.e. mobile version websites) are designed to be less data heavy when compared to main sites and will therefore consume less data. Review the settings of your social media accounts. Facebook, for example, has a feature which automatically plays videos that feature on your timeline. This will result in a considerably higher amount of mobile data consumption. You can stop this by changing your Facebook settings to run such videos only when connected to WiFi or to not play videos automatically. Can I use mobile data whilst travelling? Yes, you can use the Internet on your mobile phone when travelling. When you are abroad there are certain mechanisms which help you to prevent any data bill shocks. For further information take a look at the FAQs on Roaming found in this section. What electronic communications services can I subscribe to? You can subscribe to the following electronic communications services; mobile telephony, fixed telephony, television and Internet services. These services can be purchased either on a standalone basis or in a bundle (i.e. 2 or more services bundled together). Usually, when subscribing to a bundle, the price of the services tends to be cheaper than when purchased on a standalone basis. Additionally, service providers offer certain packages on a minimum duration of one month to a maximum duration of 24 months. What should I do before selecting an electronic communications service? Before selecting a service provider and/or taking up an offer, it is important to consider what is most important to you, whether it is the cost, quality of service, duration of contract, customer care services, billing arrangements or any other factor. Consider your particular usage patterns, for instance, how often you use the service, at what time of the day you intend to use the service, etc. The following tips will help you identify the service provider and/or offer that best matches your individual needs. Shop around and compare the offers of the various service providers. For instance, if the level of customer care service is important to you, call the different service providers to enquire about the service you need. Such communications with customer care personnel will provide you with an insight into the level of customer service provided by the service providers. Check any testimonials and promotional material such as discussion programmes, adverts, leaflets and so on. Do not base your choice solely on information provided from such sources. This information might not be fully comprehensive and if you base your decision solely on such information, there may be important terms and conditions which you may not be aware of. Review the MCA's Communication Services Section to find out what types of electronic communications services are offered in Malta. What information should I look for in a contract? TERMINATION PROCEDURE: Make sure you are aware of the disconnection procedure when terminating your service. For further information take a look at the FAQs on Termination of Service found in this section. COMPLAINT AND ENQUIRY HANDLING PROCEDURE: Find out what you would need to do if you wish to complain or enquire about the service. Also, find out how long the service provider takes to answer enquiries and complaints. What factors should I consider when subscribing to an electronic communications service? Decide whether you prefer to subscribe to a pre-paid service (with top-up cards) or a post-paid service (a signed contract having a specific duration). If you intend to buy a mobile phone from a service provider, check whether it is network locked or SIM card locked. In both cases, it is important to identify the applicable charges should you decide to unlock the phone. Before selecting a mobile package you should consider your usage pattern. For example, certain service providers offer packages for those who use mostly mobile date, SMS services or calls. There are also add-on bundles which can be purchased. Take note of the various time bands: peak and off-peak bands used by the service provider, if any, as these may differ from one service provider to another. Calls made to numbers starting with the prefix '800 X XXXX', referred to as 'freephone' numbers are not charged if the call originates from a fixed telephony line. Nevertheless, you may incur a charge for calls made from your mobile. Check the TV channel line up as this differs from one package to another as well as from one service provider to another. This is subject to commercial negotiations between the service providers, broadcasters and other content providers. Check for any add-on services which may be offered by service providers, which normally include movies and sports packages. High Definition (HD) content may also be available; however in order to view such channels you require a television set that supports HD format as well as an HD set-top box. Look out for the Internet speed especially the typical speed range (TSR). Check whether any download limits are applicable. Review any traffic management policies which the service provider may apply in case of network congestion. How can I obtain the above information? Read and understand all the terms and conditions attached to the service you are considering subscribing to. It is very important that you read the terms and conditions carefully before signing a service contract. Review the terms and conditions by accessing the service providers' websites as they are published online. Furthermore, such terms and conditions are also available at no cost at the service providers' outlets for inspection by prospective subscribers. Contact operators’ customer care services. If there is anything you feel is not clear in the terms and conditions, do not hesitate to ask the customer care personnel or sales persons to explain it further. How should I proceed after selecting a service? When communicating with the service provider, take note of who you speak to, record the date, time and the main outcome of your communication. What is considered to be radio equipment? Radio equipment is equipment which intentionally emits or receives radio waves for the purpose of radio communication or radiodetermination makes systematic use of radio spectrum. What is the MCA’s remit with regards to radio equipment? The MCA is the national regulator of the electronic communications sector and is entrusted for the effective management of the radio frequency spectrum in accordance with the National Frequency Plan. The MCA is also responsible for the licensing of radiocommunications equipment. What are the main legal instruments governing radio equipment? How can I be sure that wireless equipment can be used in Malta without problems? Wireless equipment or devices require the use of radio frequencies in order to operate. Operating a device on a frequency band which is not allocated for use by that specific type of device can cause undue interference to other services. It is therefore important that you are well informed before purchasing and/or importing wireless equipment or devices from abroad in order to ensure that these can indeed be used locally in conformity with national regulations. In accordance with current regulations wireless equipment is classified into two different categories, being Class 1 and Class 2. Class 1 equipment or devices operate on harmonised technical conditions, can be used safely in Europe including Malta and is generally licensed under the General Authorisations (Radiocommunications Apparatus) Regulations (S.L. 399.40). The list of Class 1 equipment is maintained by the European Commission. Click here to access the list of Class 1 equipment. As stated above, equipment operating on these frequency ranges are also required to comply, from a technical and regulatory perspective, with the provisions of the General Authorisations (Radiocommunications Apparatus) Regulations. These Regulations reflect European harmonised conditions, and therefore in using any radio equipment locally one should ensure that the equipment is set to operate on European standards. This is most relevant with respect to equipment, such as WiFi and DECT phones, which are also compliant with non-European standards. Please refer to the technical manuals or if in doubt, confirm with the seller that these settings are available before purchase. On the other hand, Class 2 equipment or devices generally require an individual licence from the MCA before being installed/used locally. This licence is granted following submission of an application form and payment of the relevant fees. Is the CE mark a mandatory requirement? The CE mark is not regulated by the MCA. However, in accordance with national regulations all radio equipment (i.e. both Class 1 and Class 2 devices) shall be CE marked in accordance with the Radio Equipment Regulations (S.L. 427.41). What basic verifications shall I do prior importing radio equipment? the equipment has a ‘European mode’ of operation. In case of doubts please contact us prior ordering the equipment in order to guide you accordingly. It should be noted that MCA’s guidance will strictly relate to the regulations enforced by the MCA and does not imply automatic compliance with other regulations, standards or requirements, however so described, falling under the responsibility of the other relevant competent authorities. In addition, the final decision and authority to approve or refuse the release of the product rests solely on Customs. Are there any penalties if I breach national regulations concerning radio equipment? Yes, it is an offence to install or use equipment which is not compliant with national regulations. A breach may be subject to a fine not exceeding €10,000 for each equipment. DECT 6 cordless telephones that operate on non-European harmonised frequencies such as 1920 - 1930 MHz. Wireless access systems such as WiFi equipment operating on the 2.4 GHz band with a maximum power exceeding 100 mW (20dBm) e.i.r.p.